This data set contains a single text file which reports vertical profiles of CO2 concentrations measured at the Pará Western (Santarém) - km 67, Primary Forest Tower Site. This site is in the Tapajos National Forest located in north central Brazil. Measurements extend from January 2002 through January 2006. The profile concentration data were used to estimate the change in vertical average concentration between the ground and flux measurement height in order to calculate the column average storage of CO2 (Saleska et al., 2003). CO2 concentrations were measured at 8 levels on the tower (62.2, 50, 39.4, 28.7, 19.6, 10.4, and 0.91 m). Sample air was drawn at 1000 sccm (standard cubic centimeters per minute) through 8 profile inlets in sequence (2 minutes at each level) and then a mixed air sample was simultaneously drawn from all 8 levels to obtain a total column integral (once every 20 minutes) and analyzed with an infrared gas analyzer (IRGA, LI-6262, Licor, Lincoln, NE). Data were averaged over a 1 hour interval. The profile IRGA was zeroed between each profile sequence and an absolute calibration at 325, 400, and 475 ppm was made every 6 hours. High accuracy for CO2 was obtained by these frequent calibrations and long-term precision was verified by a single cylinder of long-term surveillance standard (375 ppm), measured weekly, and that remained onsite for as long as the experiment operated. 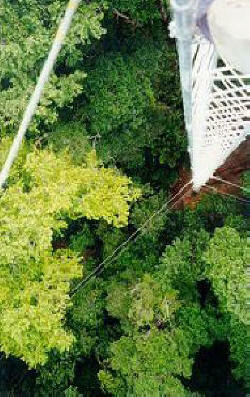 CO2 profile concentration measurement at the km67 flux tower sites, Tapajos National Forest, Santarem, Para, Brazil. Measurements extend from January 2002 - January 2006. The CO2 profile data are reported in one comma separated ASCII text file, km67_co2_profile_2002_2006.txt . All of the profile data are reported in km67_co2_profile_2002_2006.txt. The profile concentration data were used to estimate the change in vertical average concentration between the ground and flux measurement height in order to calculate the column average storage of CO2 (Saleska et al., 2003). Calibrations of the eddy system for CO2 were made every 6 hours (April 2001 - November 11, 2002 & March 29, 2003 - November 15, 2003) or 12 hours (November 12, 2002 - March 29, 2003 & November 15, 2003 - January 24, 2006 ) using 325, 400, and 475 ppm CO2 standard gases. The instrument was zeroed every 2 hours. The long-term accuracy of the instruments was ensured by measuring a surveillance standard (traceable to NOAA/CMDL standards at 380.45 ppm) once per week, this tank lasted through the duration of the measurements. Calibrations for water vapor were made using the daily fluctuations of Tv - Tk, where Tv is the sonic temperature (related to the speed of sound provided by the sonic anemometer) and Tk is the ambient temperature. This approach was necessary due to failures in the chilled mirror hydrometers originally installed for this purpose (see Hutyra et al, submitted). This data is available through the Oak Ridge National Laboratory (ORNL) Distributed Active Archive Center (DAAC) .